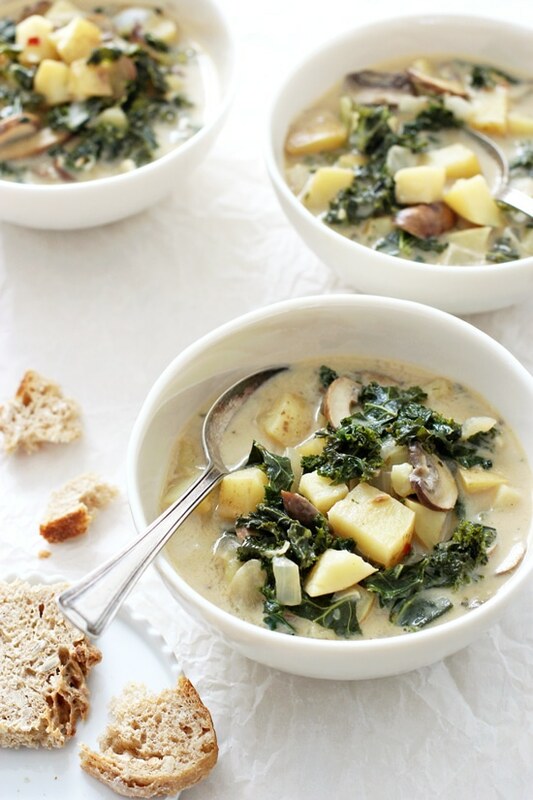 Today we talk creamy, dreamy vegan zuppa toscana! Because we are officially in the thick of soup season and if you are anything like me, you can absolutely use another recipe to add into your rotation. Says the girl who eats soup ALL YEAR ROUND. So! Today I bring you a delicious option in the form of this copycat version of the famous Olive Garden dish. My dad has looong been obsessed with their zuppa toscana soup … meaning I’ve been planning to recreate a lighter, healthier take for far far too long. A few years long to be exact. Clearly I have a foolproof recipe creation system. But! It’s finally here! 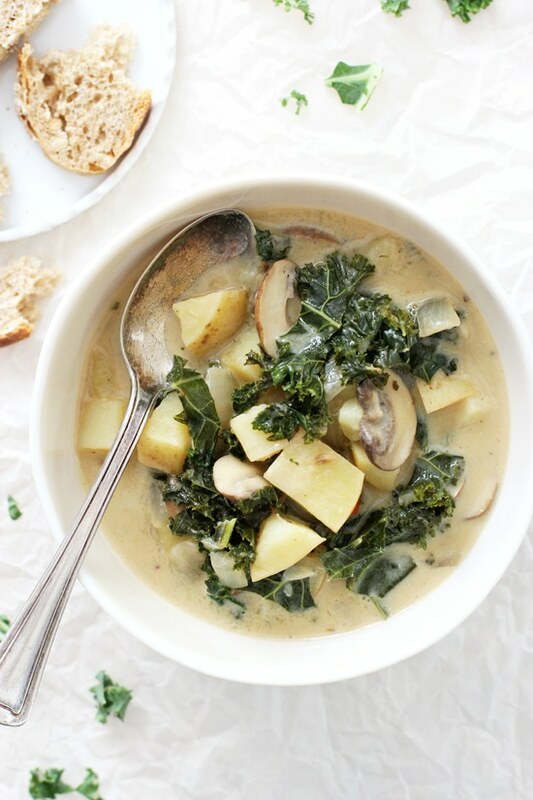 Made with coconut milk, kale and yukon gold potatoes, this dreamy dish is easy, simple and only requires one pot! And while there’s no sausage, bacon or heavy cream involved, it is still jam packed with flavor. From a few simple ingredients – fennel seeds, soy sauce and vegan worcestershire – that help to impart that sort of meaty, umami flavor found in the classic dish. And between the combination of the three, I promise you that this really does taste like the original. Yesssss. Now, this soup just borders on what I consider a weeknight meal – it takes a touch over one hour to make. BUT it’s largely hands off once you get it going on the stovetop. I’ll count that as a win. So … cheers to soup season and all the cozy, steaming bowls of wonderfulness for the days of winter to come! First up, let’s talk about the potatoes. Make sure that you cut them into ½ inch chunks – this ensures that they cook quickly and in the allotted time. Wait to prep the kale until after you get the rest of the soup simmering on the stovetop. This will shave about 5 minutes off the overall recipe time. 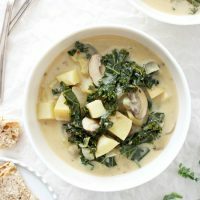 While kale is typically used in the classic version of this soup, I think collard greens would make an excellent substitute, especially if you happen to have them on hand! To keep this soup gluten free, be sure to use gluten free tamari (and not regular soy sauce) and check the ingredients on your worcestershire sauce, as many brands contain wheat. Additional Cozy & Healthy Soup Recipes You Might Enjoy! Easy stovetop vegan zuppa toscana! This copycat version of the Olive Garden recipe is light, healthy and packed with flavor! 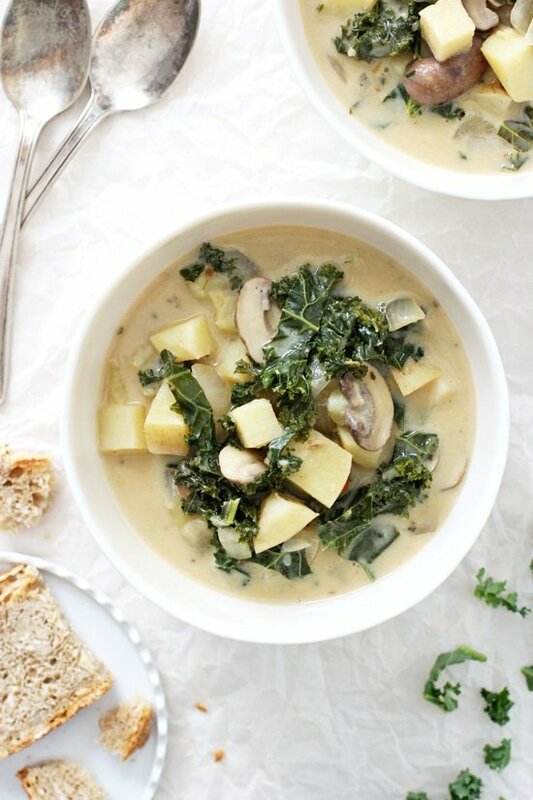 Made with coconut milk, kale and yukon potatoes! Dairy free and only one pot required! Add the olive oil to a large stockpot or dutch oven set over medium heat. When hot, add in the onion and cook for about 2 to 3 minutes, until it starts to soften. Add in the garlic and fennel seeds and cook for 30 seconds, until fragrant. Add in the mushrooms and cook for about 5 minutes, until softened. Stir in the potatoes, broth, oregano, thyme, salt, pepper and red pepper flakes. Increase the heat and bring just barely to a boil. Turn down the heat and simmer for about 15 minutes, or until the potatoes are fork tender. Stir in the coconut milk, kale, soy sauce and worcestershire sauce. Continue to simmer, adjusting the heat as needed, for about 10 minutes, until the kale is nice and tender. Remove from the heat. Taste and adjust the salt / pepper to taste, if needed (I usually add a touch more salt to really make the flavors sing!). *Be sure to check the ingredients on your worcestershire sauce if you are gluten free - many brands contain wheat!